We finally managed to wake up early! Which we really needed after the last three days. I was freezing cold, of course, so I was wearing rainpants and rain jacket and toque and gloves. We had a long flat then down traverse. It was definitely the fastest walking of the whole trip. The day was beautiful, especially after it warmed up a little bit. The sky was blue, the sun was shining, and the big billowy white clouds did not look in the least bit threatening. The down was relentless, I felt so bad for all of the upbound traffic. At first we could say, you’re right there, it’ll flatten out after this and then you’ll reach Duck Creek! After about an hour though, we couldn’t offer the “you’re almost there” encouragement so we just said – you’re doing great, it’s a beautiful day! I couldn’t believe the number of people, how fast some of them were moving, and how early some people must have gotten up. Some people were coming all the way from Red’s Meadow and it was barely 9am. 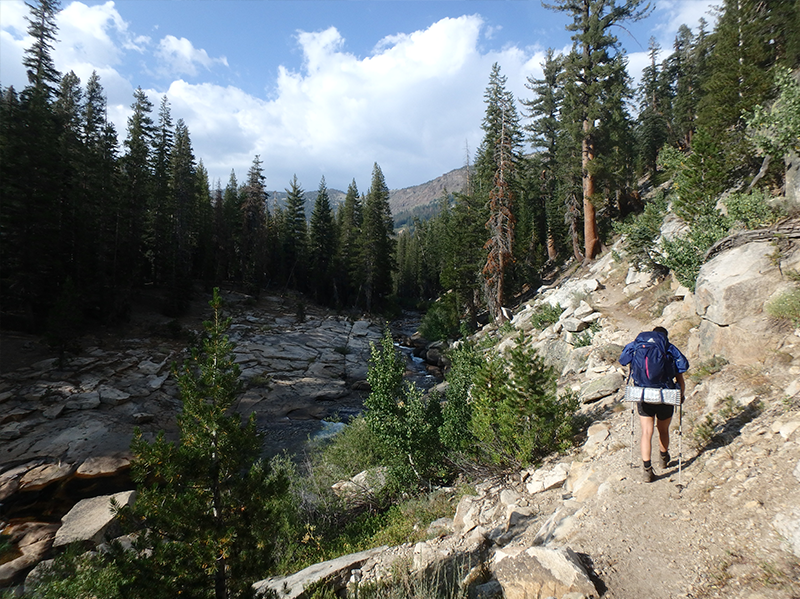 We didn’t get as many vistas during this section, but the trail was beautiful. 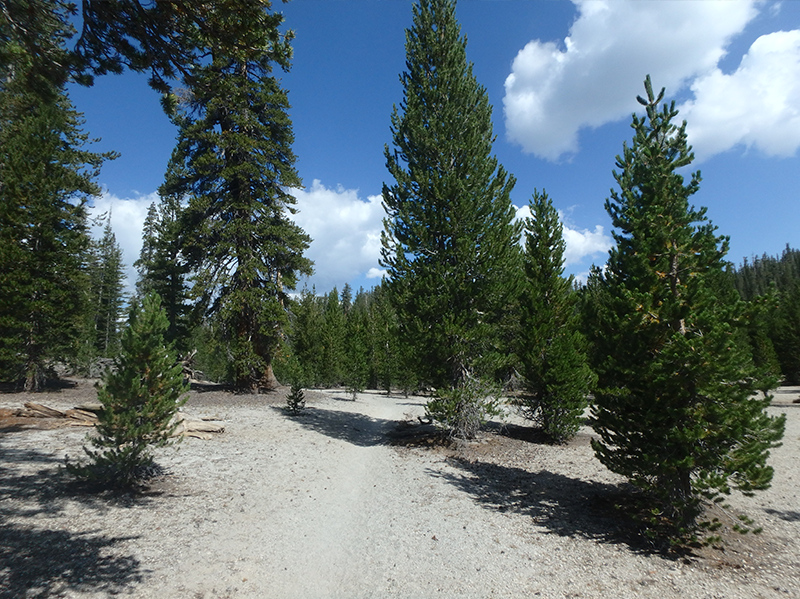 The trees were so tall and they were spaced out so you could really look up/around and admire the sun shining through, the blue backdrop, and the big white rocks littering the ground. We made it to Deer Creek pretty quickly, considering our usual pace, and enjoyed a nice trail mix snack on a log near the creek. 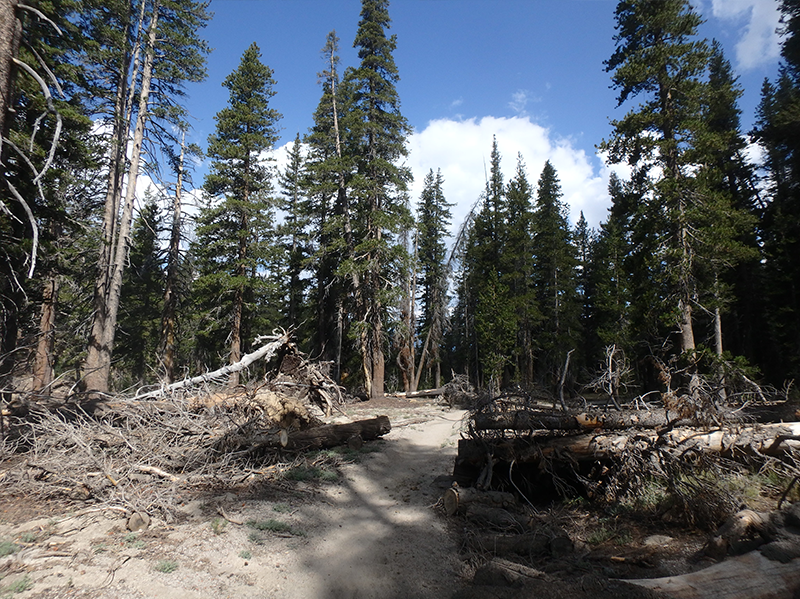 It was clear that this was a popular camping spot, we were dismayed to see bits of garbage and toilet paper around the campsites, and not entirely unhappy that we had stayed at Duck Creek. Soon after this, we walked along what felt like a beach; thank god it didn’t last long because each step was made more difficult as our boots sunk into the sand. The farther along we went, the more people talked to us about the beers and shakes at Red’s Meadow. Everyone seemed refreshed and feeling good after having stopped there. I didn’t really feel like we had earned it like those guys since it was only our fourth day (and does our first day really count?) but I was seriously looking forward to it! We could see in the distance a completely cleared out hill, all of the trees having perished in a relatively recent wildfire. 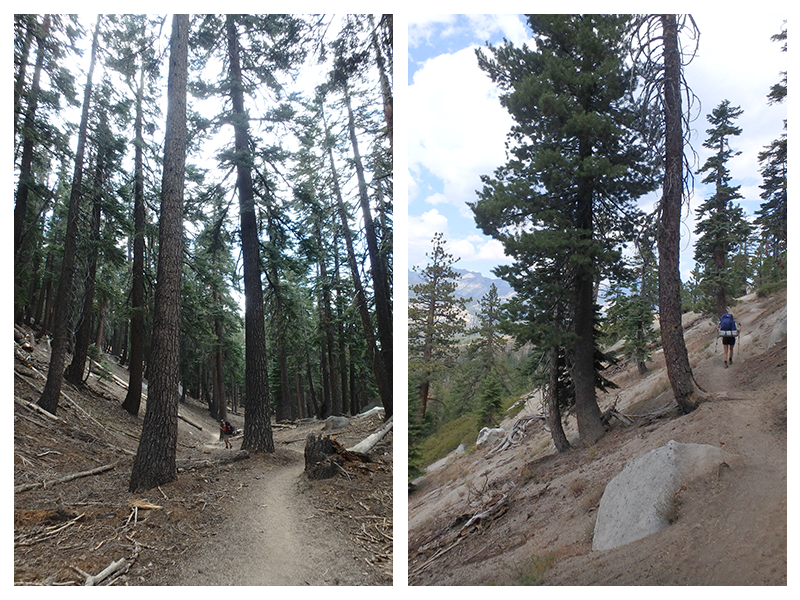 It looked really cool in the distance and we were both excited when we realized the trail was taking us right there. 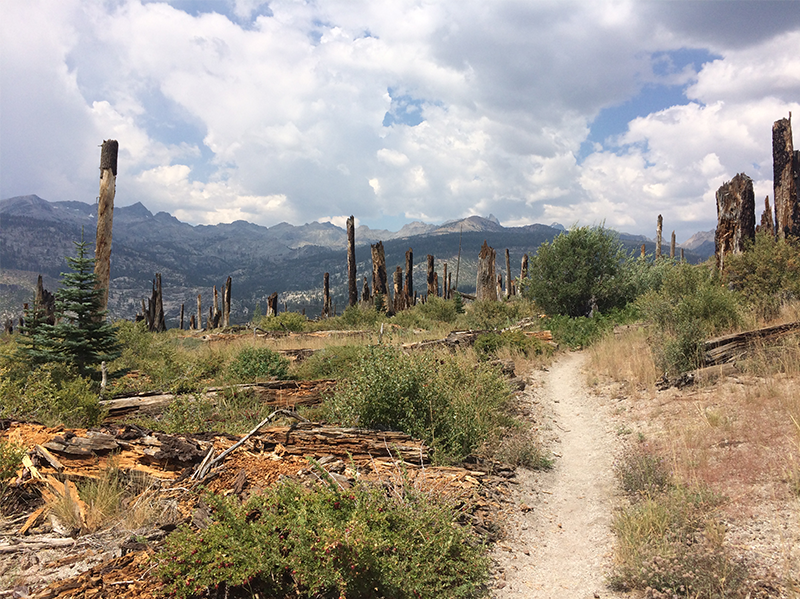 Walking through the burned out area was one of the really interesting parts of this walk. I had never seen anything like it, and I almost felt like I was walking through a painting. There was already some very hardy vegetation with prickly branches and prickly berries that was growing along the trail. Life finds a way! 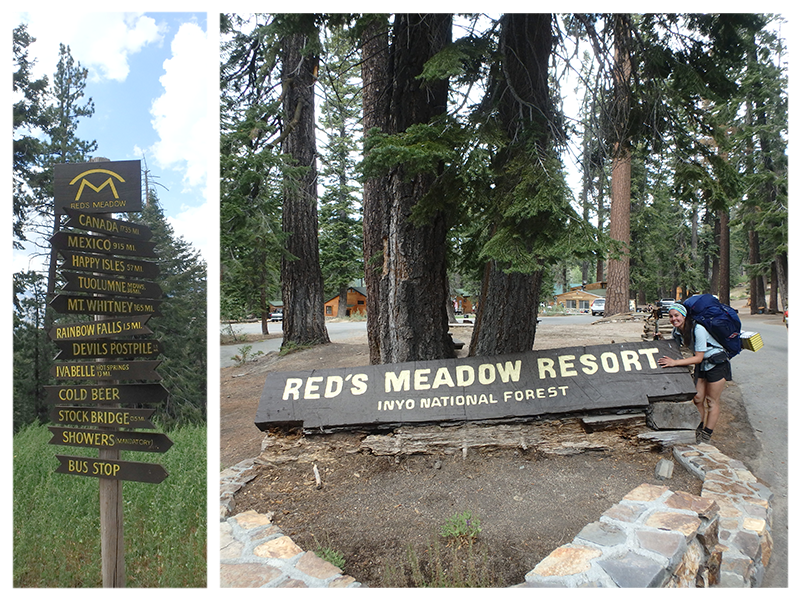 Just after noon we reached the famous Red’s Meadow Resort! It was sort of weird to see all these families with young kids and clean people. I was thrilled to go to the bathroom and rinse my face in the running water. I still didn’t quite fit in with the clean people, but there were clearly others who had been out longer than us. I met a girl in the bathroom who was doing the full JMT with her boyfriend. She had started at Whitney and was on DAY SIX, hoping to finish the following day. She was very modest as she explained that they were from the area so the altitude didn’t affect them. Oh okay, that explains it! We got our milkshakes, chocolate and strawberry, sent a postcard to Greg’s parents and bought a new map (we had fallen in love with the one from Sarah and Mark but it only went as far as Red’s so we wanted a similar one for the last leg of our trip). 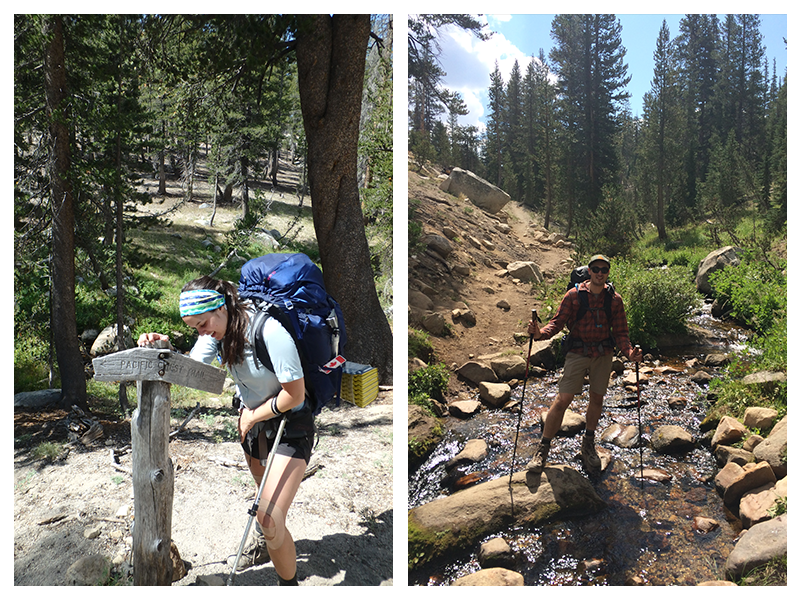 We looked over the itinerary, reviewed the literature, evaluated our journey, calculated the distances, and decided there was no way we were going to make it to Rush Creek. 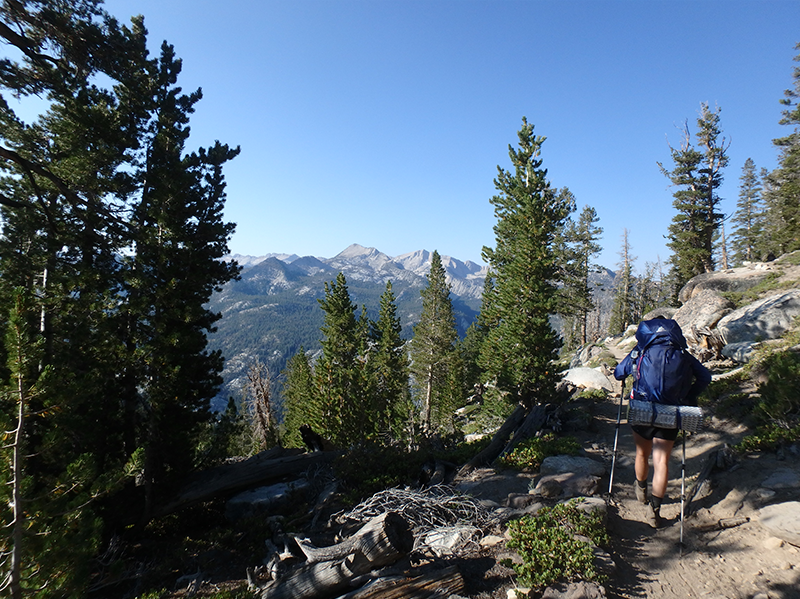 Slightly disappointed, we turned away from our JMT plans and set our sights on Agnew Meadows via the PCT, the only other reasonable exit point for us. 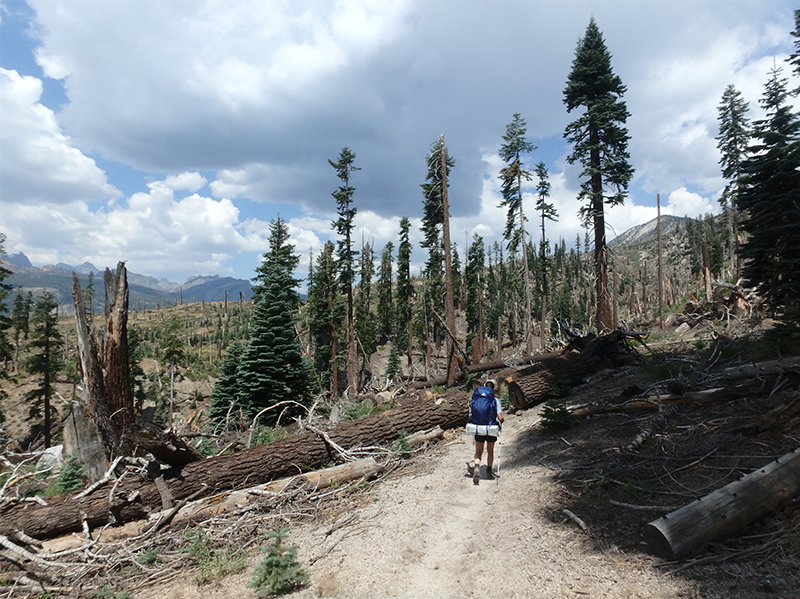 I would have loved to laze around for a bit longer, but we still had to make it through Devil’s Postpile and set up camp. 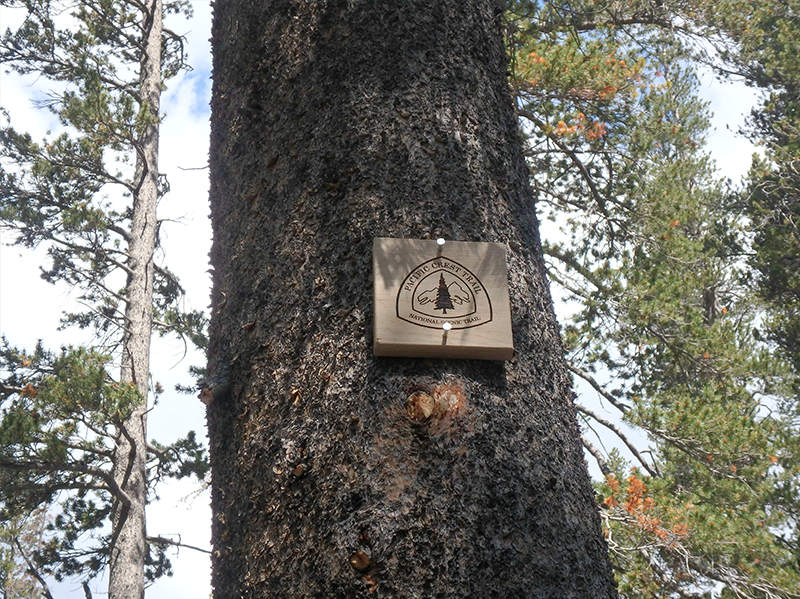 As we approached, and then entered the Devil’s Postpile National Monument we speculated on what this could be. I had been to Devil’s Tower as a child and thought maybe it was similar. (Tired Miyoko logic: the fact that they both have the word “Devil” means they must be similar). 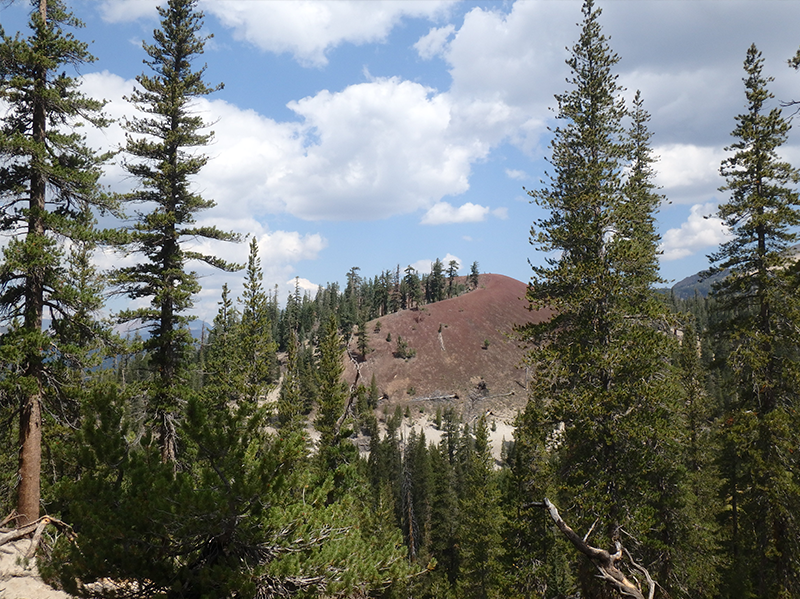 I then switched to the theory that a postpile was a pile that one builds out of rocks to support a post. 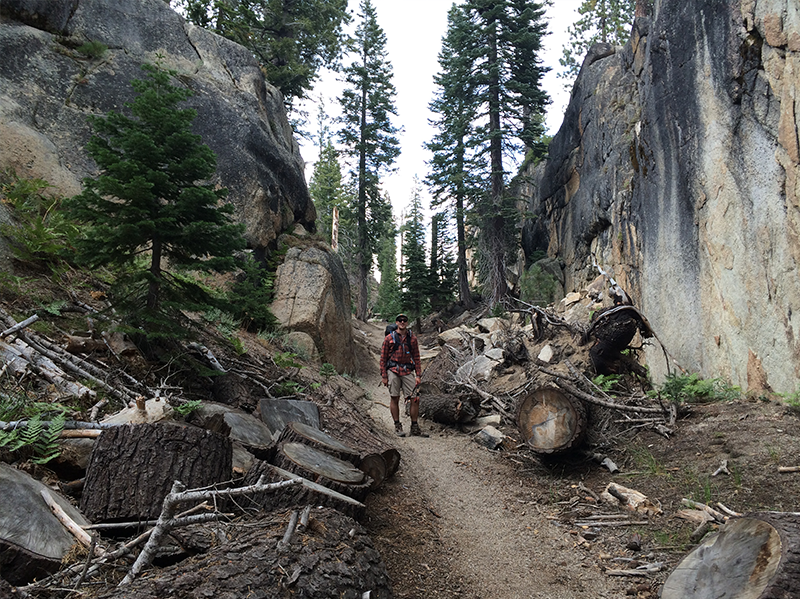 Greg’s theory was similar, postpile = a huge pile of rocks. (I was pretty disappointed when I got home and Googled it and found out we had missed out on seeing some pretty cool geology). 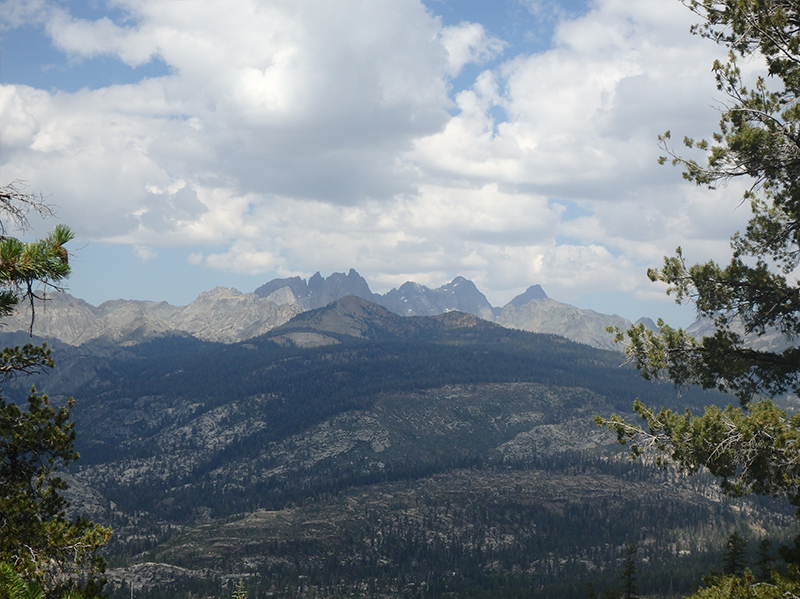 As we climbed up through the monument, we heard thunder and I turned around and realized that those non-threatening fluffy white clouds in the distance had turned into grey overcast above our heads. We kept moving, but when we turned around and saw the Red’s Meadow area looking like it was getting rained on, we put on our rain gear. Soon enough, the rain reached us and we were drenched. I was just happy it wasn’t hail! Considering all the people we had seen on the trail earlier that day, and all the people at Red’s, we couldn’t believe that we were all alone. We didn’t see anyone else, although we heard a dog barking in the distance. 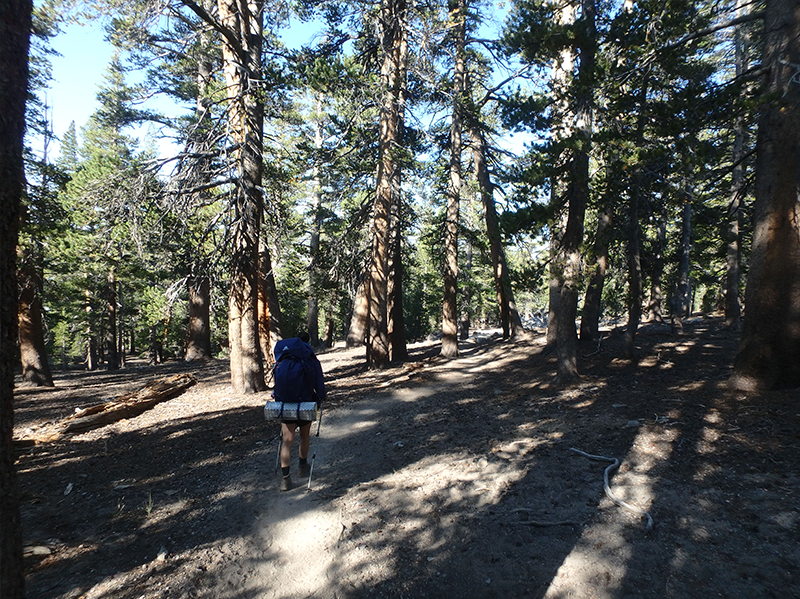 When we reached the PCT/JMT junction, we looked at the map one last time and confirmed we had no choice. With 29ish miles left on the planned route we just weren’t going to make it. We keep walking and see 2 women who said they had taken a shuttle and gotten off at Soda Springs and we were about 2 miles away. We are both dripping and disappointed as we keep walking. I feel guilty because I know I’m the weaker link. 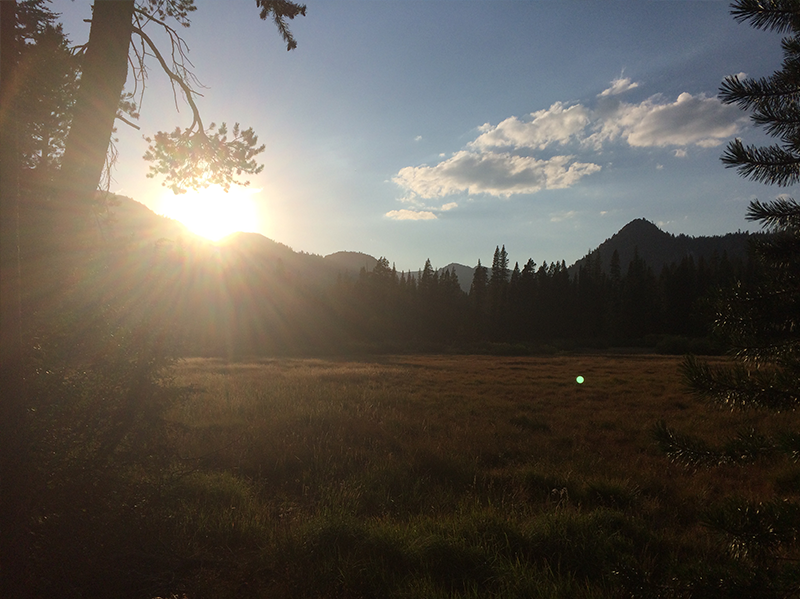 We reach Soda Springs and Greg says he’ll find us a campsite, and then I have this sudden burst of -no not energy- but defiant stubbornness. I don’t want us to throw away our plans just like that and only walk 5.5 miles over the next two days. 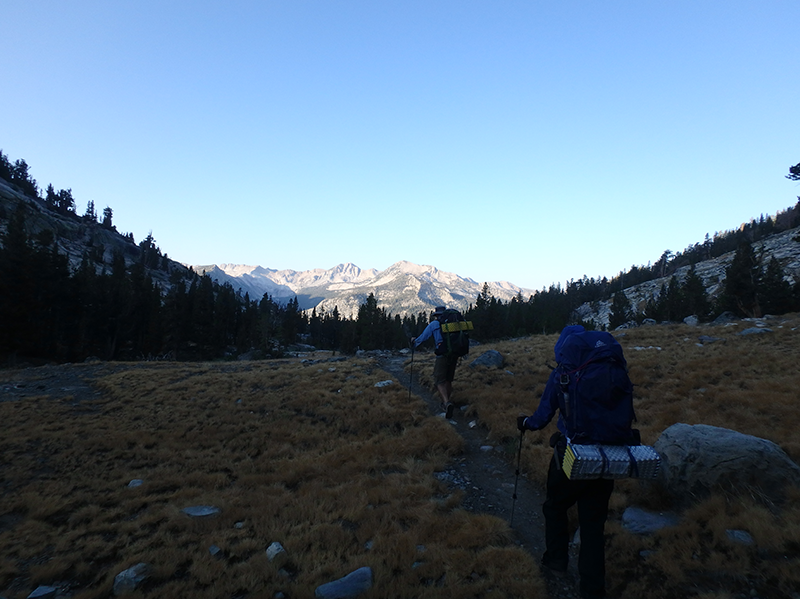 We decide that we can do this, it’s mostly down to Agnew Meadows and if we reach there by the end of the day, we can make it to Rush Creek. We push on with renewed resolve, but the 5 miles seem to take forever. We met an old man going the opposite direction and he tells us there’s a bit of flat, a fair bit of up and then down before we get to Agnew. The views help keep us moving, as well as the signs. We had barely seen any the first few days and now we were getting a countdown: 3 miles, 1.5 miles. They weren’t coming as quickly as we’d like but we were determined. We finally reach the switchbacks up, it doesn’t take too long, but the down on the other side seems to. We sing to pass the time. 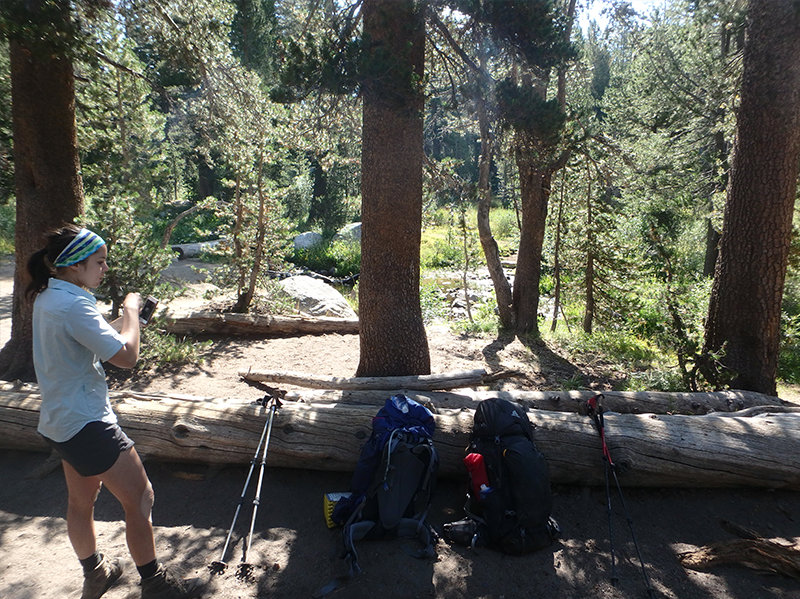 We finally reach the trailhead and I probably could have cried with relief if I wasn’t so dehydrated. We see a “Road Closed” sign so we walk up the road the other way. We reach a packing station. $hit. There isn’t supposed to be one there. Pull out the map. Oh. We walked the wrong way. Seriously discouraged. Turn around. Head down the closed road. 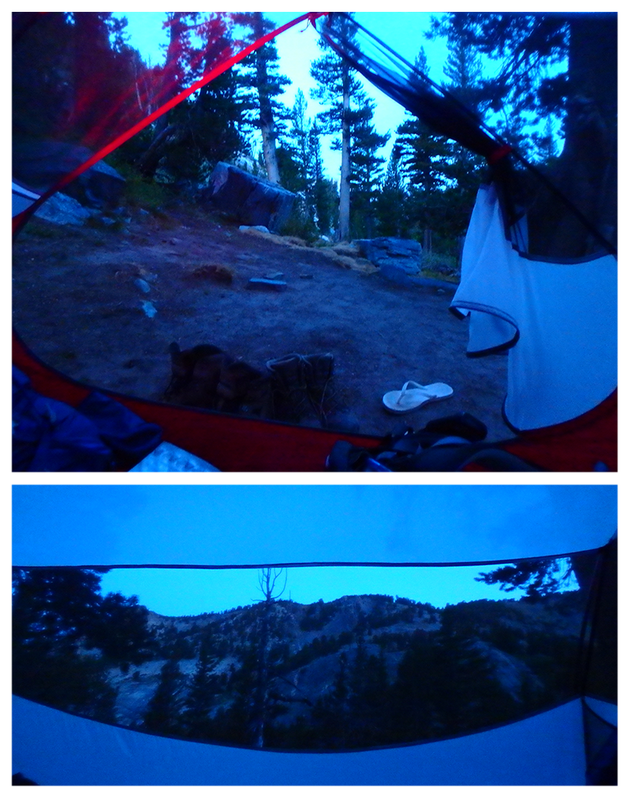 Reach campground. There’s no one there! We walk around the campground a bit and see abandoned tractors but no people, yell out “HELLO? !” a few times to no avail. My mind is racing like what is going on, it’s August, what is this place?! We are both seriously annoyed and say screw it, we set up our tent in a random campsite. They can charge us tomorrow morning if they come around.